The cyberknife treatment cost in India ranges between USD 6,000 to 8,000. The low cost of procedure in India for the same level of medical care and expertise makes thousands of medical tourists travel to India to get cancer treatment using cyberknife. Cyberknife surgery treatment cost in India is fairly less than what people have to pay in other countries popular for medical facilities, including the US and the UK. This is one of the primary reasons why medical tourists prefer to visit India to reap the benefits of this latest technology. It is a relatively new type of radiosurgery system that makes use of the robot to deliver stereotactic radiotherapy. It is a frameless, non-invasive and painless technique that help treat cancer patients with greater accuracy and precision than any other traditional radiotherapy procedure. Cyberknife surgery treatment is used to deliver multiple high doses of radiation to cancer patients. The advanced technology enables surgeons to directly target the tumor with extreme precision, thus eliminating the risk of damaging surrounding tissues and organs. This is one of the biggest disadvantages associated with traditional radiotherapy procedures. Moreover, the use of cyberknife technology has eliminated the need of hospitalization stay after the procedure as the patient requires minimal post-operative care after treatment. In addition, no anesthesia needs to be administered during treatment. What are the best cyberknife hospitals in India? Why Is Cyberknife Treatment Expensive? Because of the complexity involved in the system and the mere fact that it is new, cyberknife treatment is uncommon and a bit expensive than other traditional radiotherapy procedures. 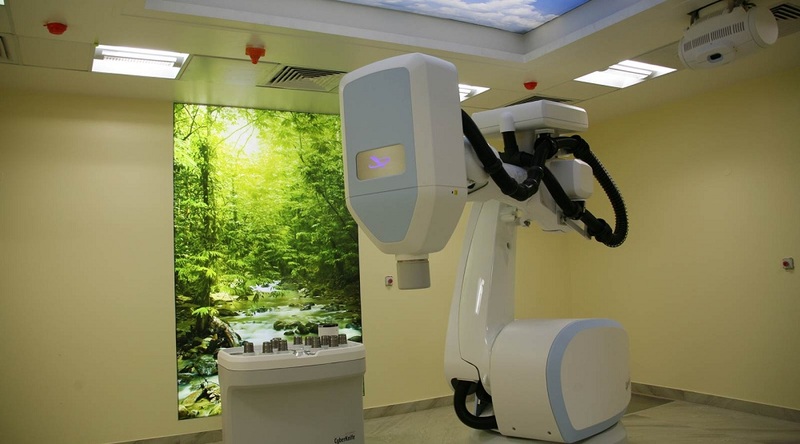 The cyberknife treatment cost accounts for the collaborative use of image guidance system, robotic arm and linear accelerator to track the tumor and destroy it with extreme precision. In addition, the system continuously monitors the movement of the tumor in the body of the patient in real-time and also makes an adjustment. Thus, the amount of radiation can be maximized according to the exact location of the tumor, thereby limiting the exposure to other healthy tissues and organs. This is not possible with any other technique, a factor that makes cyberknife treatment cost more than other techniques. India is one of the few countries that offer highly-specialized treatment using cyberknife technology. In fact, India is one of the top countries in the entire Asia Pacific that conducts cancer treatment with advanced forms of cyberknife technology. The cyberknife treatment cost in the US ranges between USD 35,000 to 65,000, depending on the type of hospital, the duration of treatment, doctor’s fees and insurance coverage. Patients with no insurance coverage are not able to afford this advanced technology and reap its benefits. On the other hand, the cyberknife treatment cost in India ranges between USD 6,000 to 8,000. The low cost of the procedure in India for the same level of medical care and expertise makes thousands of medical tourists travel to India to get cancer treatment using cyberknife. Lower cost of cyberknife treatment in India does not mean that the overall quality of treatment in compromised. This technique is used by a team of highly-specialized doctors, who weigh all options before performing cancer treatment. However, medical tourists traveling to India for treatment should carry the PET scans or MRI image of the tumor with them. Doctors from the best hospitals in India for cancer treatment tend to look at these scans before accepting the patient and to provide an estimate of what cancer treatment using cyberknife technology would cost. The cost of cancer treatment using cyberknife provided by the hospitals typically covers all logistics, hospital stay and medical costs.